In between cold fronts the fishing has been spectacular! The 27/28 Fathom ridge has been holding some nice wahoo. High speeding has been the ticket. The 60-90′ reefs have been holding good numbers of king mackeral and cobia. Slow trolling live baits has proven most effective for these fish. As the water continues to cool the Cobia will be moving south so keep a watchful eye. Closer to shore the spanish mackeral have also been very consistent. The preferred lures lately have been small spoons and rattle traps. 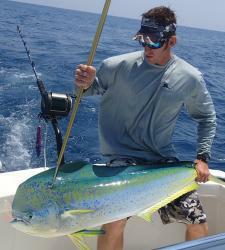 Captain Chris is a true Florida native and has been an avid Florida fisherman for nearly 30 years. He has captained his own vessel for over ten years on the east coast of Florida and has extensive knowledge of the Canaveral area. His knowledge and experience allow him to target a range of fish species for a year round fishing experience.